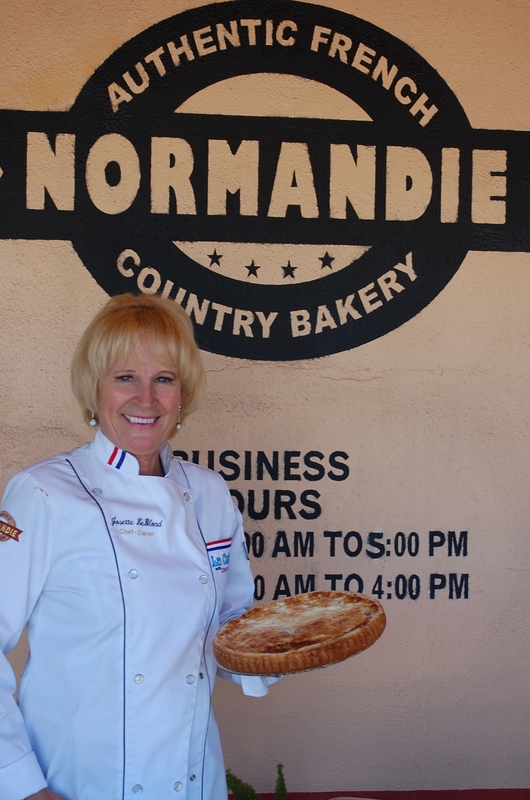 Walking into the covered patio of the Authentic French Normandie Country Bakery, I was greeted by a pretty, petite blonde woman with bright pink nail polish. Raised in a charcuterie in Normandie, France, she learned her hard work ethic by working side-by-side with her father. At six she butchered her first pig. Years later she made her first pate. Chef Josette LeBlond is passionate about running her two bakery/restaurants, performing on her cooking show, Le Cuisine with Chef Josette, and making sure her operations run smoothly. She arrived to America on July 4th 1985 and met the Executive Chef of the Queen Mary restaurant. Impressed with this delightful blonde, he offered her a job to make her tasty pates. Her pates became so popular, that she opened her first shop in Long Beach. Later, LeBlond bought the 42,000 sq. ft. building on Cochran Ave in 1989. As we toured her facility, she proudly introduced to me one of her first employees. He has been working with her since 1985. He helps make one ton of pate a day for this restaurant and a smaller one in the Farmers Market. LeBlond sells her pate to Bristol Farms, Albertson’s, Ralph’s, Pavilions, Gelsons, hotels and other restaurants. Sky Chef purchases her gourmet foods for different airlines. 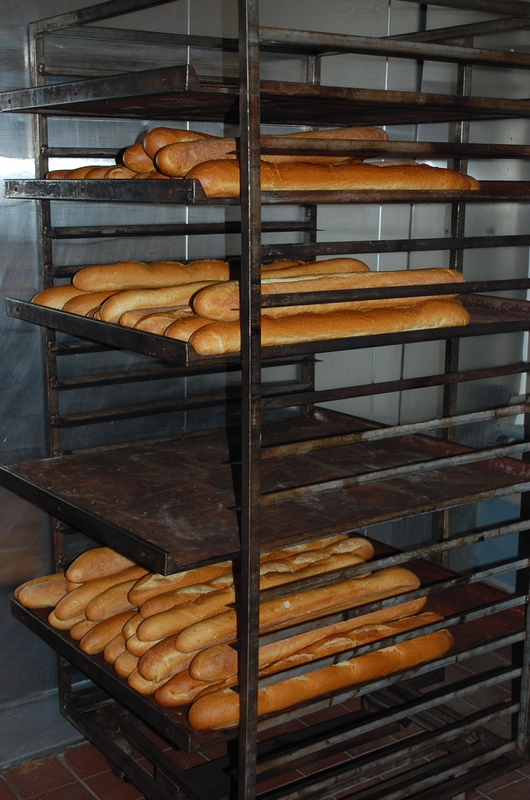 From midnight to 8 p.m., her team bakes fresh baguettes every three hours and sells 1,500 per day. Early morning deliveries start the day. Chef Josette proudly showed me her 5 delivery trucks parked out in the loading dock area. I smiled as I noticed her Chef Josette picture on the back of each truck. Her employees work hard seven days a week, yet gladly do it, because of LeBlond’s loving personality. She treats her employees as family. Excitedly, LeBlond showed me pictures of her husband, Tony Sacca. He is a handsome, well-known actor and entertainer in Las Vegas. The two of them commute weekly to their homes in Las Vegas and Los Angeles. After touring the party room, where guests can rent for parties, weddings and special events, we sat down to an authentic French lunch with her sister from the South of France, Annick. We started with a basket of sliced baguette and a lovely plate of pates. The bread was soft and snowy white inside and crunchy and golden colored on the outside. We spread a light pink duck liver pate with truffles and took a bite. Made from 75% duck liver, 25% duck meat, herbs and spices. It’s rich, slightly sweet and tastes like a gourmet meat loaf. Next to the pate was a black pepper campagne with sliced pistachios. The duck meat has been marinated in cognac. It was exquisite. LeBlond wanted me to experience a true French lunch and brought out a Merguez plate with three beef and lamb sausages with fries and a pool of French Dijon mustard. The sisters each cut a small slice of the sausage, dipped it into the mustard and delicately guided it into their palate. LeBlond shared that her family would have this dish for lunch and during barbecues in France. When she came to the United States, she couldn’t find a Merguez plate anywhere, so she started making her own. The small casing and perfect color make this appetizing sausage superb. Looking at these thin sisters I remarked, “How do French women stay so thin, eating food like this?” the two sisters just laughed. I observed how they ate. Instead of taking a slice of baguette and spreading the pate all over the top, they tore a little piece of bread, spread a small amount of pate and enjoyed the flavors bursting in their mouth. With the Merguez, they ate three slices of sausage, a few fries and left half the food on the plate. Unlike many Americans, these French women don’t feel that they have to “clean their plate.” They eat until satisfied and then push the rest away. 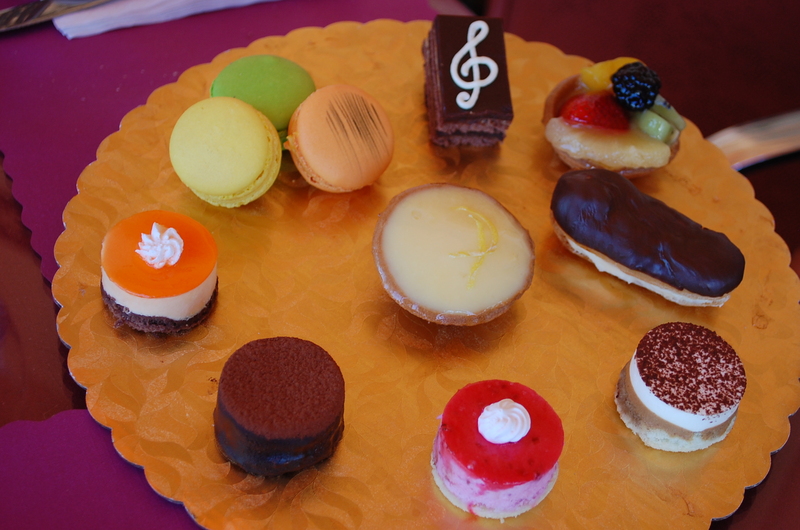 For dessert, we shared an assortment of petit fours. LeBlond’s lemon tart was my favorite. She uses fresh lemons, milk, sugar and egg yolk to make a crème anglaise. Her raspberry and mango mousse is made from purees from France. I also enjoyed her fruit tart with fresh strawberries, blackberries, kiwi, pineapple and peaches. She makes macaroons in 12 different flavors. The passion fruit, caramel and pistachio were delectable. On February 7, 2011 LeBlond opened her Farmers Market store. “They gave me an offer that I couldn’t turn down. I wanted to open before Valentine’s Day to sell all of my romantic and delicious cakes, pastries, pates and breads,” she said with a sparkle in her eyes. Her baguettes are delivered twice a day to this location. Once at 9 a.m. and again at 2 p.m. “I tell my customers to eat the bread today or take it home, cut it, and freeze it immediately. Then take it out to thaw and serve when needed,” advised LeBlond. It keeps the bread tasting fresh, just like everything else she serves at Normandie. LeBlond offers catering service for weddings, parties, executive meetings, and corporate meetings. Her breakfast menu offers a range of items under $7. For lunch and early dinner she offers salads, hot and cold sandwiches, appetizers and entrees. Hours for the Los Angeles location at 7 a.m. to 5 p.m. on Monday – Friday and 7 a.m. to 4 p.m. on Saturday. 3022 S. Cochran Ave. (323)939-5528. At the Farmers Market try Chef Josette’s pate and petit fours at stall #330, (323)930-1944. Published in the Beverly Press/PArk LaBrea News 4/7/11 via Normandie Bakery and Pat.